Amp'd Adventures - Electric Bike Tours and Rentals! Whether your mission is hauling goods or people, or staying organized with limited storage space, Pedego has the perfect bike for you! The amazing Stretch Cargo Bike delivers the goods (literally) with spacious front and rear racks for transporting stuff and people! It's perfect for taking a young passenger along, or as a working cycle in a busy urban area where time is money! The dynamic Latch folding bike is perfect for riders who need the power of a Pedego, but have limited space to store or transport their bike when not in use. The Latch folds down in less than 30 seconds for easy storage - you have to see it to believe it! 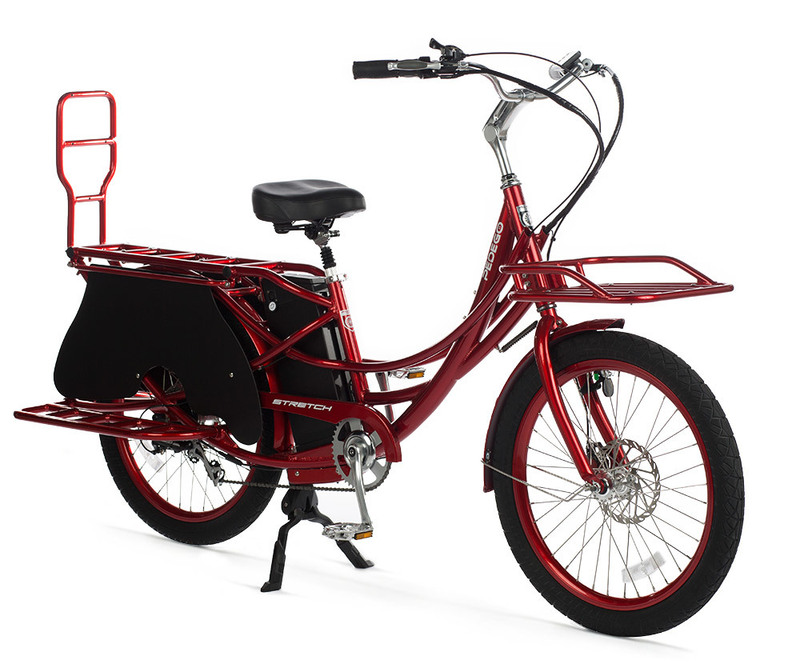 The Pedego Stretch Electric Cargo Bike is perfect for moving people and stuff with ease! With a cargo capacity up to 400 pounds, and a front and adjustable rear racks, this beast is up to tackle what ever business or pleasure you have in mind! - Side racks that may be moved from top to bottom. - A back rack that may be turned over to accommodate different kinds of cargo. - A front rack that is attached directly to the frame, so it doesn't move with the handle bars. - Protective wheelskirts to keep fingers and toes out of harm's way. - A deluxe saddle with a suspension seat post. - A quick release handlebar stem that allows for easy adjustment for the perfect fit. - Traditional city style handlebars. - Extra wide tires for a nice, smooth ride. 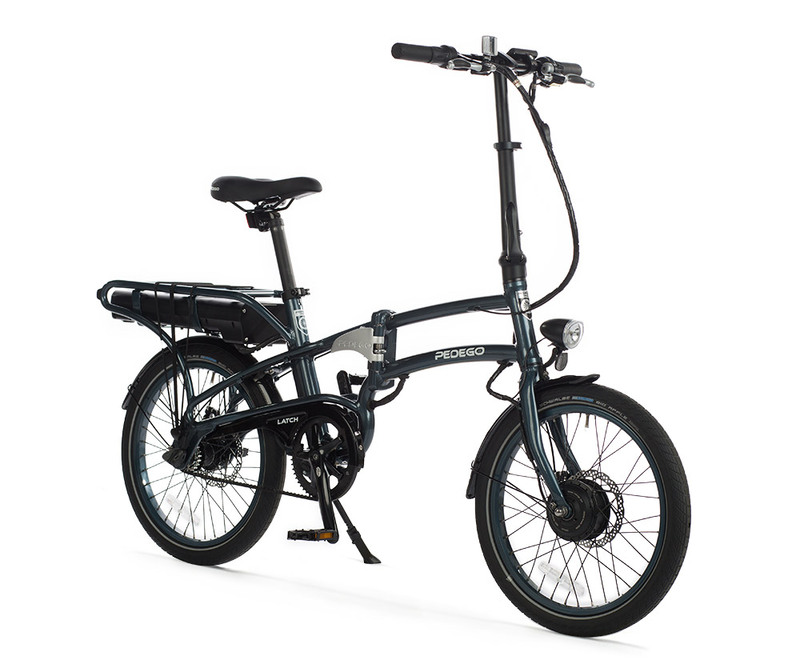 The Pedego Latch is an electric folding bike like no other! Though it is built for easy folding for storage and transport, it sacrifices nothing in the fun and power category! The Latch folds down in about 30 seconds, and can be supported by the seat post, or by pads on the rear of the frame for vertical storage. Unique to the latch is a Gates carbon belt drive for a quiet ride with no grease, and no derailleur to bend or break! - Belt drive for a seamless, quite ride without messy grease. - Internally geared hub for easy pedaling and smooth shifting - even at a complete stop! - Folds to a compact 33"x18"x32" for simple storage and transportation. - Weighs just 50lbs (43 without the battery)!